Its fair to say that Jurassic World is a departure from our recent programming. It is a sequel to the previous films, most notably the 1993 classic as the other two are considered less than ideal follow ups. This revival of a perennial 90's blockbuster is the most thrilling film I've seen from 2015.
from their other projects. Luckily for Chris Pratt he is easily distinguished from his role in US sitcom Parks and Recreation thanks to the films he has chosen since then. Even as a fan it was pleasantly surprising that Pratt shot to fame as Star Lord in Guardians of the Galaxy, then as Emmet in the Lego Movie given that neither was expected to be anywhere near as good or successful as they were. Jurassic World is his first film as a recognisable leading man, and he definitely earns that distinction. Pratt plays ex-marine Owen Grady, who was hired to develop a bond with the Velociraptors under his supervision. He names them Charlie, Lou, Delta and Blue (Cuthbert, Dibble and Grub), and they each respond to these names. Grady sees the dinosaurs as animals and not theme park assets which gives him a unique relationship with them which is presented with the subtlety of a sledgehammer. The alternate lead Bryce Dallas Howard as Claire does a great job as his opposite, a seemingly robotic woman overly concerned with statistics and achievements. Her development is interesting to watch as she is the one character that you can see changing, and her performance reflects that well. In other films this might be a criticism, but Pratt plays his steely ex-marine character well enough that is doesn't matter that he hasn't developed or grown in some way by the end. Grady arrives with a knowledge and experience that make him vital in many points of the film, and he is totally believable as a no nonsense action man, a total dispatch from the Parks and Rec role that made him famous. The films score of course includes the classic Jurassic Park theme in various forms, which is still amazing over 20 years on. In fact I would encourage you to look it up on YouTube while reading this review to make it a little more epic. I loved the moment where the theme hits its peak and we see the Jurassic park in full for the first time. 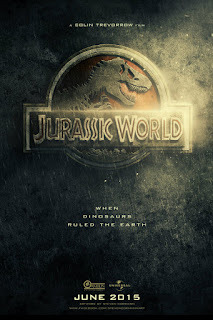 A film like Jurassic World requires a great deal of world building, and this is done brilliantly without taking away any screen time from the story. The park was shot on the site of a closed down Six Flags theme park and so is laid out authentically. We also see many different attractions such as the petting zoo and the gyrosphere which provide a sense of what the park is like and I enjoyed this. What took me out of it though was the staggering amount of product placement. It feels like they had a bizarre lack of confidence in the film being a box office draw so enlisted sponsorship from *deep breath* Beats headphones, Converse, Verizon Wireless, Coca Cola, Mercedes, Samsung, Jimmy Fallon, Mercedes, Ben & Jerrys, Pandora, Samsung, Starbucks, even more Mercedes, even more Samsung and others I may have missed. Perhaps you could play a fun game of spot the endorsement? breathing dinosaurs is a bit laughable at first, this is claimed because scientists are almost finished 'designing' the ultimate attraction. 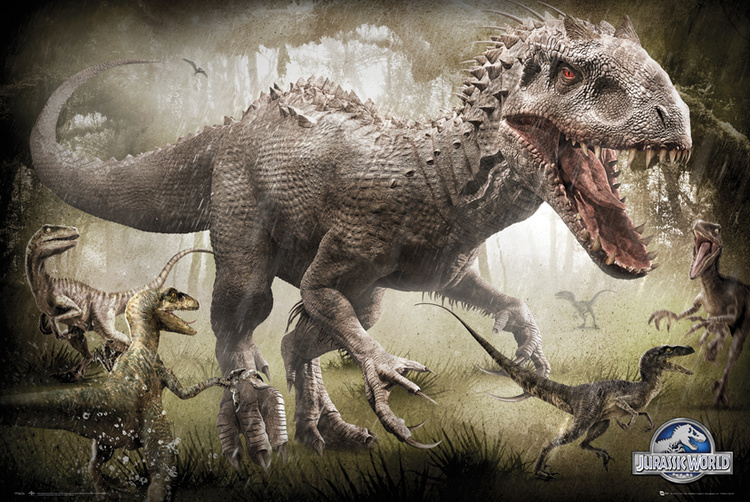 The Indominous Rex is a genetic mix of a T-Rex and a slew of other classified species in order to manufacture the most fearsome creature ever. This (naturally) backfires when the beast outsmarts the humans who created it and escapes, wreaking havoc on the entire island. The film does a wonderful job of building up the the creatures presence in a way that the best monster movies do. The first half of the film takes the Jaws approach by not overexposing us to the killer dinosaur, and so it feels more satisfying to see it causing mayhem up close later on. Without wishing to spoil anything I also really enjoyed the setup and conclusion, which you can see from a mile away but is still a gratifying payoff. I'm not personally a fan of the 'blockbuster' action movie but I found myself gripped by Jurassic World. I loved the build up of the Indominous Rex, the presence Chris Pratt has and the development Claire goes through. All of that combined makes for a terrific film, and you completely forget about the two previous misfire sequels. This is the perfect follow up to the original. Granted there are a few obvious plot holes, and even some plot craters but you aren't watching Jurassic World for an infallible story. You are watching to see beautifully crafted Dinosaurs, and there are no disappointments in that department. There is a healthy but not too extravagant amount of nostalgia, which you would expect in a film like this if you are old enough to have seen the original in the 90's. It is a film that is truly fun for the whole family. Parents can spot the references and kids can experience the living breathing dinosaurs better than they have ever been presented before. All generations can enjoy this two hour adrenaline rush. in conjunction with Cine North. Tickets are available at £5 with a family ticket alternative. Our next screening will be The Choir on March 14th. Rich Wainwright, 2016. Awesome Inc. theme. Powered by Blogger.